Faugheen added to his Champion Hurdle triumph at Cheltenham as he clinched another superb victory at the Punchestown Festival on Friday. The 1-6 favourite, ridden by Ruby Walsh, finished eight lengths ahead of Cheltenham runner-up Arctic Fire in the Punchestown Champion Hurdle. Faugheen led all the way and pulled away from his stablemate on the run-in. With only four horses in the race, David Pipe's Dell' Arca took third ahead of Tiger Roll. The Willie Mullins-trained horse had only had three rivals to beat having scared off any would-be suitors given his commanding display at Cheltenham. Walsh was allowed to dictate matters at his own pace until quickening the tempo four from home. Arctic Fire loomed up coming out of the back straight, but as soon as Walsh gave Faugheen a squeeze the race was over as trainer Mullins celebrated his 12th win of this week's festival. 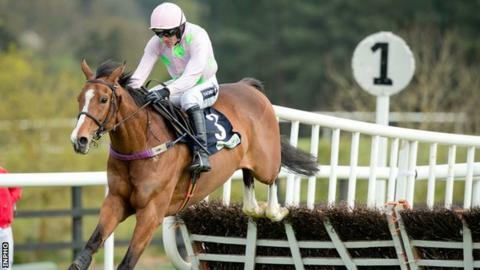 In winning, Faugheen extended his record to a perfect 10 out of 10 in his career to date. "He even pricked his ears after the last, he's like an aeroplane," said Walsh. "He's a pleasure to ride. I felt I went quicker than I did at Cheltenham today." In the next race, Walsh was again on board to give Mullins a record-equalling 13th win of the festival as Nichols Canyon landed the Champion Novice Hurdle.